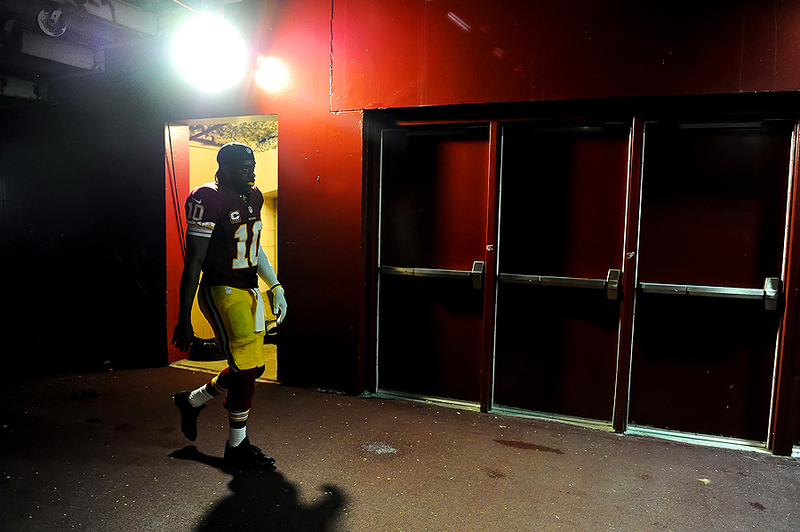 "Quarterback Robert Griffin III #10 of the Washington Redskins walks to the locker room after losing to the Philadelphia Eagles at FedEx Field on September 9, 2013 in Landover, Maryland." I'm a firm believer that access leads to unique photographs. Without it, you're seeing the same thing as everyone else. One of the best things about shooting at FedEx Field is the ability to roam the hallways and tunnels. Most other stadiums are strict when it comes to areas that fans cannot see. So after a packed sideline Monday Night Football game between the Washington Redskins and the Philadelphia Eagles I broke away from the pack. I respectfully put my back on the wall and waited for the Redskins to walk to the locker room after losing in a tight contest. Quarterback Robert Griffin III was the last one of the field - walking alone. While his body language doesn't necessarily scream dejection, his blank stare and emptiness after a loss can be felt. I'm glad I was able to get this quiet moment that fans don't usually see - that helped tell the story for the team. 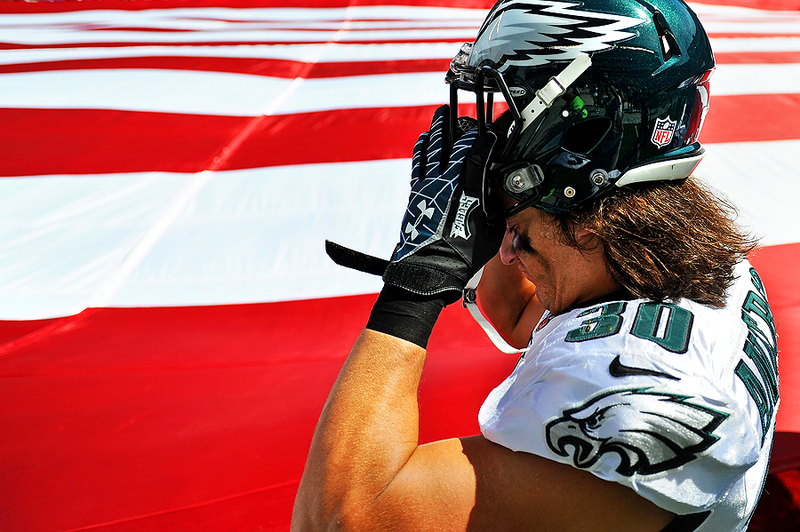 "Safety Colt Anderson #30 of the Philadelphia Eagles puts on his helmet before playing the San Diego Chargers at Lincoln Financial Field on September 15, 2013 in Philadelphia, Pennsylvania. The San Diego Chargers won, 33-30." Images always don't come easy for photographers. Shooting the San Diego Chargers play the Philadelphia Eagles at Lincoln Financial Field didn't start off to well. During the team introductions fireworks, smoke and music set the mood. It's quite the production and always makes a nice image that can later be used for upcoming stories. However, my camera's auto-focus decided to die as the Eagles took the field. So after a couple of frames I realized that and had nothing to show from the intro. But I had just enough time to switch cameras, lenses to document some players with an enormous American flag. While I had some more images of players holding the flag with military personnel, it was this brief second of mental preparation and readying for the game that I kept coming back to. 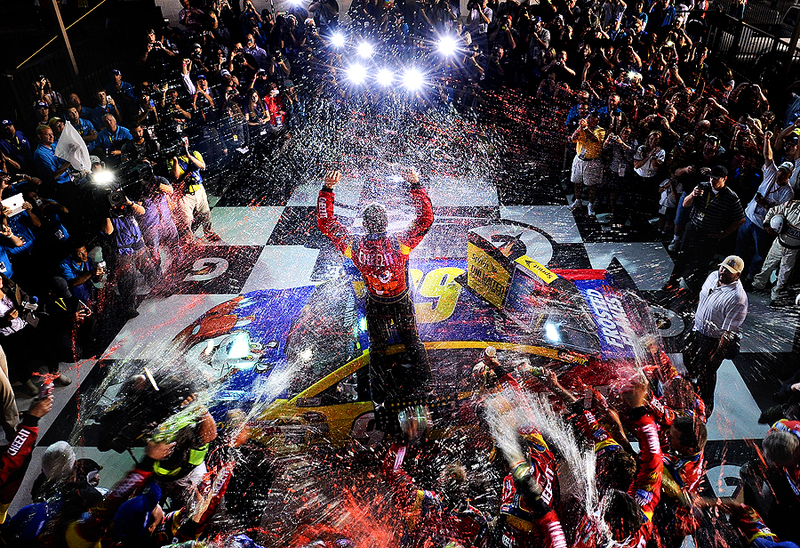 "Carl Edwards, driver of the #99 Kellogg's / Cheez-It Ford, celebrates in victory lane after winning the NASCAR Sprint Cup Series 56th Annual Federated Auto Parts 400 at Richmond International Raceway on September 7, 2013 in Richmond, Virginia." Covering the same sporting events each year, you're always looking for a fresh way to document the day. But sometimes you want to revisit the same picture you made the year prior hoping to top it. Last year, I setup a very similar remote in victory lane at Richmond International Raceway. While the year prior yielded an interesting frame, I knew there was a better frame there with a slower shutter speed. With a Nationwide race the night before, it gave me a chance to really fine tune the remote. When Carl Edwards won the NASCAR Sprint Cup Series 56th Annual Federated Auto Parts 400, things were all set - all left was to hope it fired. Splashing Gatorade and multiple flash bulbs, I ended up liking this frame much more than last years frame, but still didn't get any confetti. Maybe next year I'll attempt to improve on this even more when the colored paper streaks across the frame. 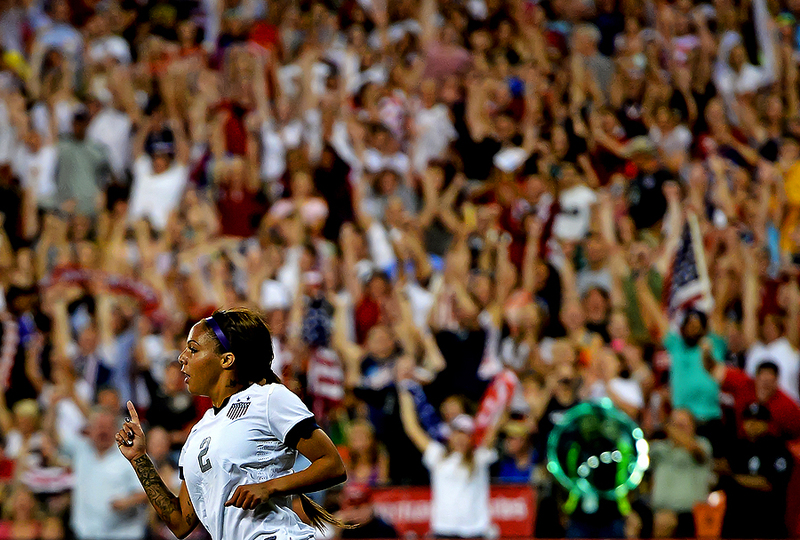 "Forward Sydney Leroux #2 of USA celebrates after scoring a goal during the first half of an International Friendly against Mexico at RFK Stadium on September 3, 2013 in Washington, DC." 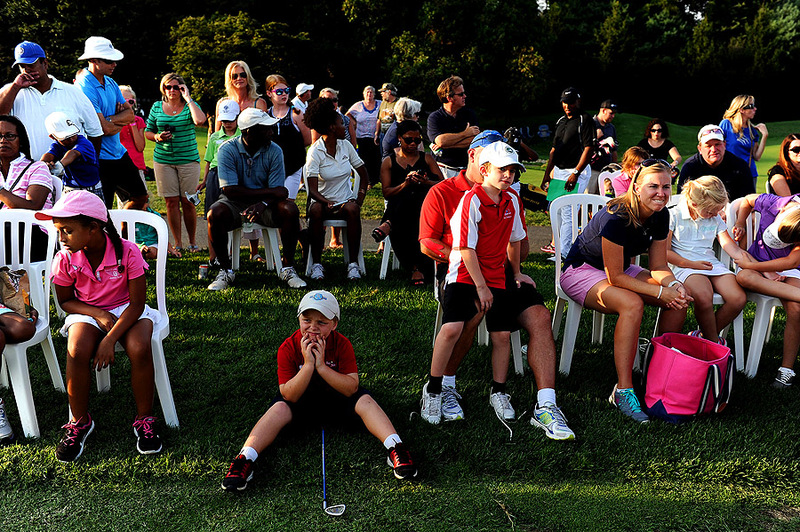 There is one question I am always asked: What is your favorite sport is to document? While I don't exactly have a favorite, there are a few that I am bias toward only because I played them my entire life - those being soccer and lacrosse. Having the opportunity to cover the USA women's national team against Mexico was a bit nostalgic and exciting besides the love for the sport. Last time I covered USA, they played Mexico in the snow in Utah. Getting to cover the same match-up in my new home was a great experience, although, the weather made for some pretty interesting images. 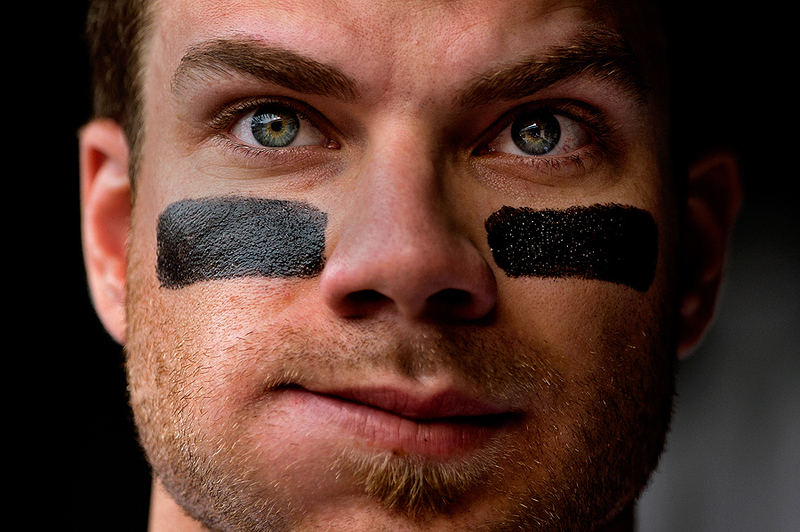 Aside from the snow, there is nothing quite like documenting a player have a standout game. I remember those games playing sports myself - you're in the zone and every play, ball and shot goes your way. Sydney Leroux had one of the games. Scoring four times, she helped the USA defeat Mexico, 7-0. "Kyle Busch, driver of the #54 Monster Energy Toyota, and wife Samantha Busch sit on the wall of the grid as they take part in pre-race ceremonies for the NASCAR Nationwide Series Virginia 529 College Savings 250 at Richmond International Raceway on September 6, 2013 in Richmond, Virginia." Details are important to storytelling. Sometimes they are either overlooked or overshot. I've certainly worked on assignments where I am drawn to lots of details images that speak volumes about the subjects. I tend to walk away with more images of these small components to the story than the person themselves. Other times, it's the complete opposite. I think the problem with details is that they're generally weaker alone than if apart of a wider story. Every once in a while, I'll see a detail image that can tell the entire story beautifully. There is nothing quite like it. With that said, images that seem important to a photographer at the time may be just a small part of the overall story. This is one of those images. In racing, there is a very distinct wardrobe of the drivers - fire-suit and driving-shoes. But I'm always drawn to that stark contrast of their support system - dressed impeccability. Covering lots of races this year, the above frame is one I keep seeing and working, but have never lined up as I envisioned it. It wasn't until I saw all-star racer Kyle Busch sitting on the grid wall with his wife in the same posture that I thought it was worth making the picture. Is it a knockout, telling picture? No. Yet it's a subtle detail that says a lot about the sport in a humanizing, larger grand scheme type of way? I think so. 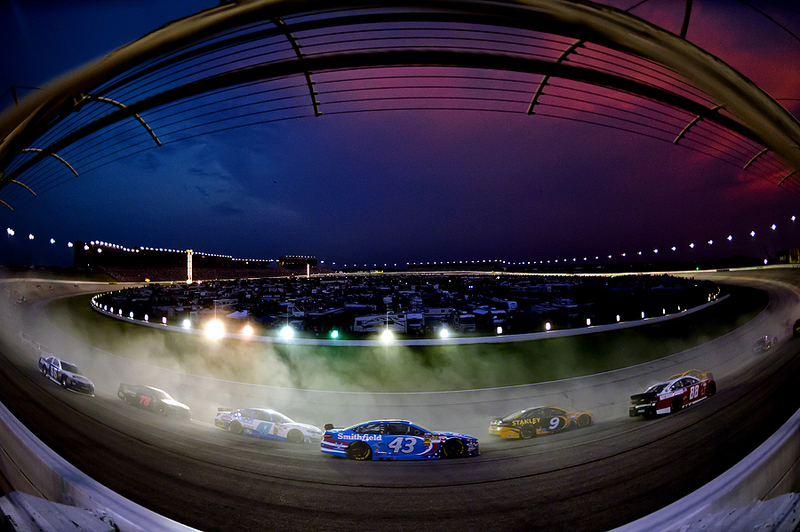 "A view of cars racing during the NASCAR Sprint Cup Series AdvoCare 500 at Atlanta Motor Speedway on September 1, 2013 in Hampton, Georgia." overall sense of nervousness when working somewhere unfamiliar for the first time. Much like when playing sports myself, I'd get that feeling. Yet once you walk onto the field, or get to work, your instincts quickly take over and you perform as normal. In the same sense, there is nothing quite like shooting at a new venue or covering a fresh story. Having the opportunity to cover stock car racing at Atlanta Motor Speedway with the Getty Images team was a playground for my eyes. Everything was new - from the city itself, to the garages and track. It was so new that when I saw the sky changing colors early in AdvoCare 500 race, I panicked for a brief moment. There was a picture to be shot, yet covering a quarter of the track myself, and having never shot there, I didn't know the proper angle to capture it. After a caution flag was thrown and they restarted the race, the quick-dry on the track made a fast concrete track look like a scene from a backyard dirt truck race. The angle, the smoke and the color of the sky calmed my nerves as I made a few frames of the quickly fading scene. 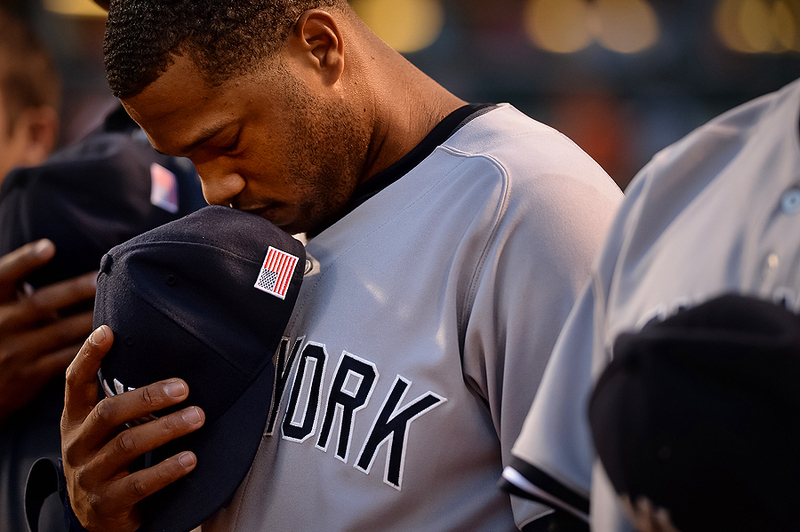 "Second basemen Robinson Cano #24 of the New York Yankees closes his eyes as the New York Yankees and the Baltimore Orioles commemorate the 12th anniversary of September 11 before an MLB game at Oriole Park at Camden Yards on September 11, 2013 in Baltimore, Maryland." Almost like it was yesterday, I remember the fear I had as a young man in high school as my classmate rushed to turn on the TV. Witnessing the attacks of September 11 was surreal. Feeling so vulnerable, and uneducated about the world around me, I had no idea what was next. Twelve years later, it's still recall that day vivdly. I'll never forget. For athletes, I always wonder their story on that said date. I haven't done any research, but from what I remember, sports were put on hold back in 2001 briefly after. Every year, I typically find myself covering a sporting event on or around the anniversary. Yesterday was no exception, I had the honor of documenting the New York Yankees as they and the Baltimore Orioles commemorated the 12th anniversary of this tragic event. A quiet moment, this image says a lot about respect and coming together as one nation before squaring off in a game pitting athletes against one another.